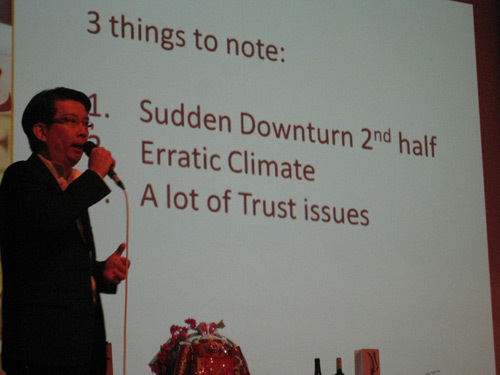 This is one of the pictures taken during a talk to 100 over business owners in February 2011. The event was known as BNI Big Breakfast at YMCA auditorium. Besides the pointers reflected on the powerpoint slides, I also mentioned that gold price will soar and property market will perform very well in 2011. All these have unfolded. And my analysis was based on the Li Chun Bazi of the year. Euro debt crisis is not unpredictable but it has surfaced this year and not next year. Why? Where in the 2011-bazi is the trigger? And why did we only see it coming in 2nd half of 2011? Tsunamis, earthquake and floods happen almost everywhere and every now and then. But why 2011 is exceptionally intense? Can we also attribute this to the Gua image of wind over water? Now, how do we relate trust issues to global arena and right to our own society? The lack of trust is the underlying reason for the aggravation of the euro crisis said some reports. The ineffiency of the management of government linked companies have undermined their role as a responsible corporate citizen. How now to regain the trust of the public? At a family level, we see a rising trend of cheating spouses with more wives cheating on their husband according to a report by Straits Time. What has the world become? Is 2012 going to be worse? Is the dragon going to rise from the sea of turbulence or drown by it?